Leica’s latest full-frame rangefinder adds a new ‘silent’ shutter, touch-sensitive screen and discrete styling – but does the M-10P deliver the goods? This is a very likeable and beautiful camera... but there is a disconnect between the traditional luxury craftmanship and the modern electronic additions. There is something reassuring solid and distinguished about the Leica M10-P. It is in its genes, coming from a long line of M-series rangefinder cameras Leica has produced since 1954. Its old-school charm and connotations of luxury are its immediate appeal. But what sets this model apart from the many others in the series that have gone before? In the same manner as with the M9-P and M240-P before it, this new P-for-Professional version of the M10 the branding of the camera has become more subtle. The red circular Leica logo is removed from above the lens mount; instead, you get a retro-style engraved Leica signature logo on the top plate. In an effort to make a luxury camera even more luxurious, the plastic hotshoe cover has been replaced with an all-metal one, matching the finish of the top plate. But there are significant changes within the brass casing and magnesium die-cast housing. This is Leica’s quietest rangefinder ever – thanks to a redesign of the camera’s shutter. The M-series has a long heritage of discrete, near-silent operation – which has held in it appeal for street photographers, photojournalists and court photographers. But this is now quieter than even earlier analogue models. In an age of Live View shooting, mirrorless mechanisms and digital shutter speeds, its competition in this area has much increased. This also becomes the first Leica rangefinder to feature a touch-sensitive LCD screen, and the first to feature an electronic spirit level. The M10-P often feels like it is two cameras in one. You have the old, much-loved mechanical rangefinder, which makes you focus by lining up a ghost image with the fixed field-of-view optical viewfinder. In practice, many die-hard Leica users use zone focusing. There are other quirks too. The battery and SD card slot are hidden beneath the chunky metal baseplate, which needs to be removed if you need access. The sensor, despite being full-frame, still only gives a resolution of 24MP. And, lest we forget, there is no video capture. But the LCD gives you a much more modern approach to your photography. The three-inch screen allows you to use Live View and focus peeking for more accurate framing – and you can either double-tap to zoom into the image for focus precision, or you can set up the camera to do this as you move the lens’s focus dial. GPS can be added using the optional Leica Visoflex (Typ 020) viewfinder, which attaches to the hotshoe. Costing £390 ($575), this offers a two-million-pixel LCD, and a tilt function (the built-in rear LCD is frustratingly fixed). This accessory can be particularly useful when you’re using ultra-wide and telephoto lenses, which the rangefinder is not well-designed to work with. The Leica acquits itself in the lab, as far as we could measure it – but we might expect this for the price. The extra electronics make this much easier to use for subjects (or photographers) where the rangefinder normally fails. Despite using similar sensors, the M10-P manages at lower sensitivities to produce cleaner images than the Leica Q. However, the X-Trans III sensor in Fujifilm’s X-Pro2 is still the benchmark. Their sensor specs may differ, but these cameras are closely matched for dynamic range. The M-10P produces marginally superior results up to ISO 400. 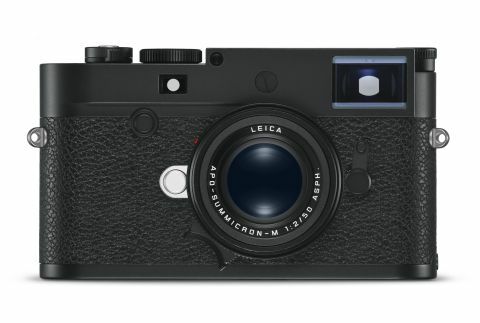 The Leica M10-P is a very likeable and beautiful camera... but there is a disconnect between the traditional luxury craftmanship and the modern electronic additions. Same, same – but different. This older version has the red dot logo, and doesn’t have a touchscreen – but it is essentially the same camera for less. Fujifilm’s Leica-like X-Pro2 has a smaller APS-C sensor, but also has a much smaller price tag and some great prime lenses in the range. Worth a look. The Q is a bargain for a full-frame Leica. Its fixed Summilux 28mm f/1.7 lens is a beauty – so no need to spend more on lenses. Offers electronic viewfinder and AF.